Thanks to all of you who wished me well after I wrote I was having a rough work week. You have no idea how much better I felt after reading words of support. As you can imagine, I'm thrilled today is Friday. While I have a big work day ahead of me, I cannot wait for the weekend where I'll be with my family and friends who are always a great source for inspiration. Keeping it relaxed and simple with my outfit as a result. UM HELLO AMAZING PANTS! I really need to get some trousers like that. 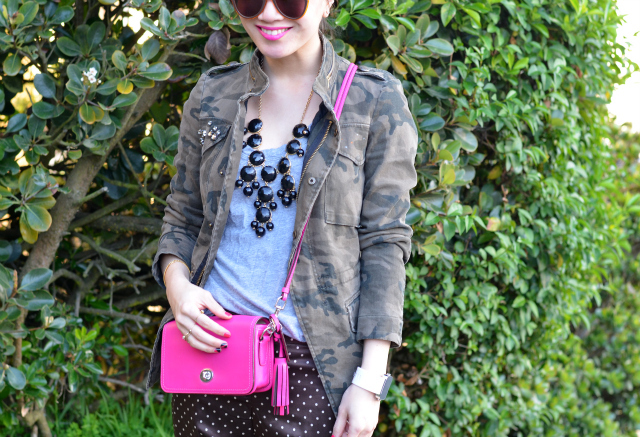 Cute camo jacket with the hot pink legacy cross-body! Thank god for fridays after a long week!! I love this combination, that necklace is really fantastic. Love the pop of pink! I love how you styled this, cute look! TGIF! Haha, hope you'll have a relaxing weekend. 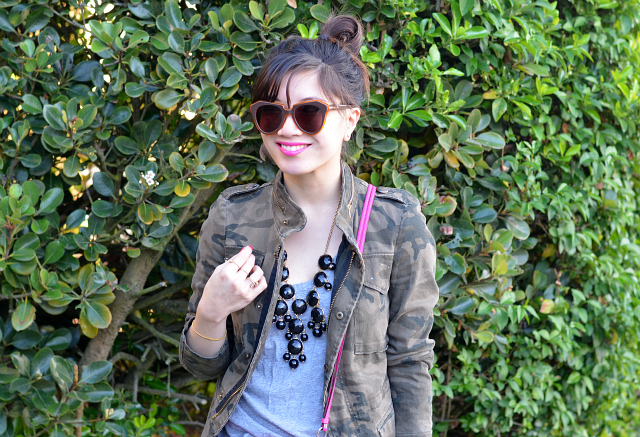 Love how you paired camo and dots together! Lovely outfit! I love that pink bag. I adore this outfit; jealous of your Coach purse, what an awesome colour for Spring/ Summer! L-o-v-e the pink bag. I'm really into pieces that pop like this lately! 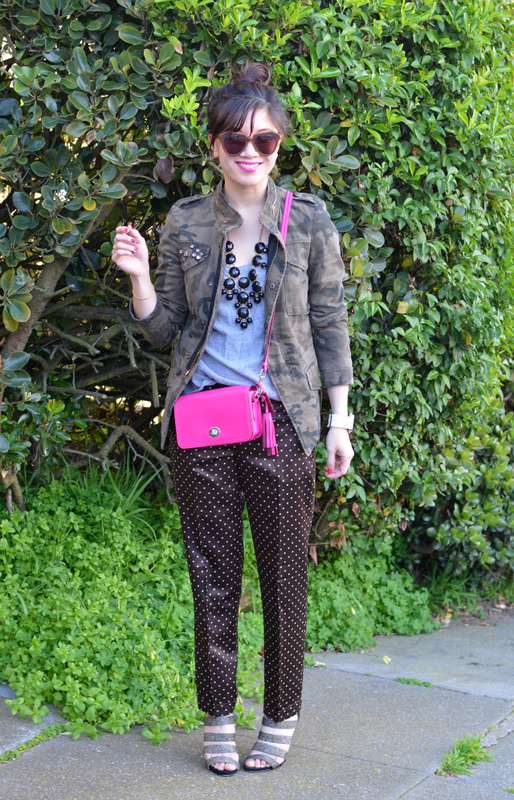 Love the jacket with the polka dots pants! Cute! I have and just love the Coach Penny purse.. So cute.. I want it in all colors.. have a good weekend.. Xo! I love how you styled these J Crew pants. When I tried them on - they looked like pajamas on me...love how you always make everything so chic! such an unexpected combination., works great! Yay for the weekend! Love the different prints and love love love the bright purse! Love your camo jacket and pink bag:)! that jacket with those pants is really a perfect combination !! This outfit is the perfect mix of casual and glam! 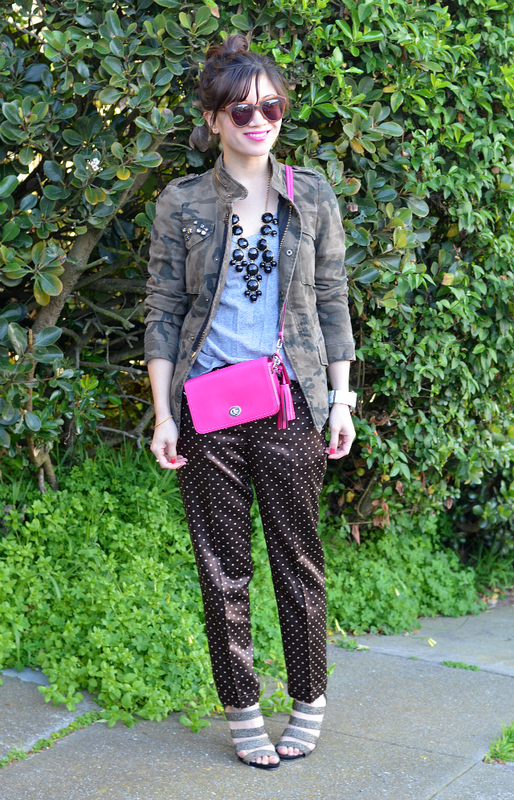 The polka dots and military jacket look so cool together, and I am SERIOUSLY coveting those shoes. Your hair is cute and I really like your necklace. I love your bright pink Coach bag! I'm thinking my next bag purchase will have to be something bright and cheery. You look so pretty in this. Oh, I love the polka dot pants! Hope you're having a great weekend, Nancy! Ooooh can't decide whether your sunnies or pants are coolest :) Love the polka dots and the almost dressed-up-pajamas feel those slacks have...but those sunnies are an awesome statement piece too! Looks like someone is dressed for a nice date !? really cool. I love your mix of prints and the coach bag is the perfect pop of color!! this outfit is so done right! i hope you got to relax and recharge this w/e! Aww those polka dot trousers look so cute on you. Such a cool outfit. 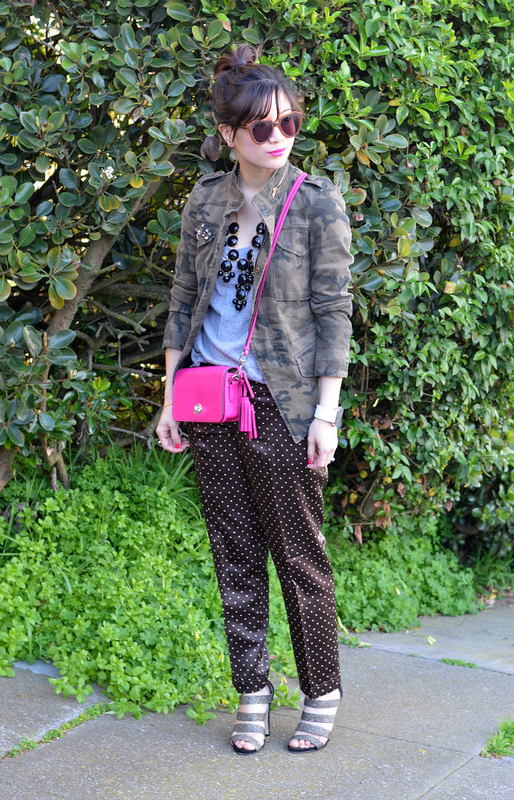 Loving the mish-mash of polka dots and camo:)! Wow,you're great at mixing patterns! Love your cute pink bag! im loving ur bun! the polkadots pants are so cute! xO! I am incredibly in love with this amazing combination!! I LOVE the accessories you chose with this outfit. That pink bag is DIVINE!